The Salar Jung Museum is an art museum located at Darushifa, on the southern bank of the Musi river in the city of Hyderabad, Andhra Pradesh, India. It is one of the three National Museums of India. The Salarjung Museum is the third largest museum in India housing the biggest one-man collections of antiques in the world. It is well known throughout India for its prized collections belonging to different civilizations dating back to the 1st century. Nawab Mir Yusuf Ali Khan Salar Jung III (1889–1949), former Prime Minister of the seventh Nizam of Hyderabad, spent a substantial amount of his income over thirty five years to make this priceless collection, his life's passion. The collections left behind in his ancestral palace, 'Diwan Deodi' were formerly exhibited there as a private museum which was inaugurated by Jawaharlal Nehru in 1951. Old timers believe that the present collection constitutes only half of the original art wealth collected by Salar Jung III. His employees siphoned off part of it, since Salar Jung was a bachelor and depended upon his staff to keep a vigil. Some more art pieces were lost or stolen during the shifting of the museum from Dewan Devdi to the present site. 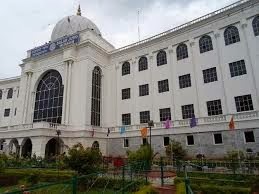 Later in 1968, the museum shifted to its present location at Afzalgunj and is administered by a Board of Trustees with the Governor of Andhra Pradesh as ex officio chairperson under the Salar Jung Museum Act of 1961. It has a collection of sculptures, paintings, carvings, textiles, manuscripts, ceramics, metallic artefacts, carpets, clocks, and furniture from Japan, China, Burma, Nepal, India, Persia, Egypt, Europe, and North America. The museum's collection was sourced from the property of the Salar Jung family. Jade crafted daggers of, Emperor Jehangir, Noorjahan and Shah Jehan. The museum building in a semicircular shape with 38 galleries, spread on two floors, displays only a part of the original collections. The ground floor has 20 galleries and the first floor has 18 galleries. The exhibits on different subjects are displayed in separate galleries. Each gallery is huge and has many artefacts on display including ones dated back to the 17th century. Apart from the galleries, there is a reference Library, reading room, publication and education section, chemical conservation lab, sales counter, cafeteria etc. Guides are available at fixed timings free of charge. The museum is open from 10:00 to 17:00 (except on Fri). Camera/Mobile :Camera are allowed for Rs.50/-.